Three councillors and an ex-civil servant have locked themselves together near a Lancashire fracking site where they claim a drill is due to arrive. 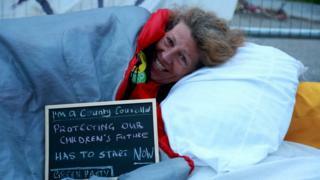 They were among 13 people who began their protest at about 03:00 BST at Cuadrilla's Preston New Road site. The protest is part of "rolling resistance" month of action by campaign group Reclaim the Power. A Cuadrilla spokesman said the protests had not affected any of the work at the site. Green Party county councillor Gina Dowding claimed local authorities had been rendered "weak and powerless" to stop fracking. She added: "I feel I need to be here with the community to say that we won't roll over and accept this. "We are putting our bodies on the line because our voices haven't been heard." Julie Brickles, an independent councillor on Fylde Borough Council who is also part of the protest, said local residents were "rightly scared and we have now run out of options". Kirkham town councillor Miranda Cox added: "I feel our way of life locally is under attack by an industry that, backed by a distant central government, is seeking to turn Fylde and Lancashire into the largest gas field in Europe." Retired civil servant Nick Danby said civil disobedience was his last resort. adding: "I have never been inside a courtroom before but, having exhausted all other legitimate means of resistance, I now feel that I have no choice but to continue my protest in the only way left available to me." Last month another group of campaigners won the right to appeal against a government decision to allow fracking at the Preston New Road site. A Lancashire Police spokesman said nine people had been arrested at the site but could not give more details.